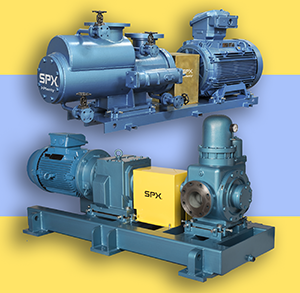 SPX Flow has announced that from its Plenty brand, comes a wide range of vane and screw pumps which are widely used for the pumping of heavy viscous fluids across industries such as oil & gas, power generation and naval, and are suitable for forced lubrication of rotating machinery and fuel transfer processes. Plenty Triro triple screw pumps provide reliable, quiet, pulse and vibration free operation, the company says. The design of these compact pumps with just three moving parts, increases pump reliability, reduces noise pollution, simplifies installation requirements and minimizes impact on other downstream equipment. Well proven within the oil and petrochemical industries, the Plenty Twinro two screw pumps are suitable for heavy duty fuel transfer in accordance with API specifications. The pumps are: designed for economical, reliable, safe operation; can handle most bulk liquid transfer duties and are used extensively in bulk loading and unloading applications. Each rotor is a precisely machined piece, the accurate screw profile ensures volumetric efficiency, accuracy, low running costs and reduced deflection even at high pressure discharge, the company adds.